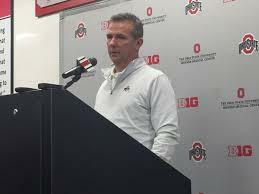 Ohio State University has placed head football coach Urban Meyer on paid administrative leave while it investigates claims that his wife knew about allegations of domestic violence against assistant coach Zach Smith years before he was fired last week. Courtney Smith made public texts between her and Meyer's wife Shelley and with with the wives of other Buckeye coaches in 2015. Smith also provided threatening texts she said came from her ex-husband. 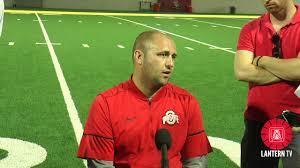 Zach Smith was fired last week after a court granted a domestic violence protective order to Courtney Smith. Veteran college football reporter Bret McMurphy notes that if Meyer or his wife — a nurse at the university — failed to report the domestic abuse, they could be in violation of Title IX. That could lead to their being fired for cause. Smith told McMurphy that her ex-husband had abused her since 2009, and that she had extensive conversations with the wives of Meyer and his staff members about it. Zach Smith had been on Meyer's staffs for 11 seasons at the University of Florida and Ohio State, McMurphy reports. Courtney Smith ex-wife told McMurphy that she felt pressured not to have him arrested. The couple divorced in 2016, and Courtney Smith told McMurphy that she recently received a protective order against him. Ohio State said Wednesday afternoon it is conducting an investigation into the allegations, and that Meyer is being placed on leave. Meyer said he and athletic director Gene Smith agreed that being on leave during the inquiry was best for the investigation. Ohio State University has fired assistant football coach Zach Smith after Smith's former wife filed a civil protection order against him last Friday and an allegation of previous domestic violence surfaced.